Size Choose an optionn/a1/4"3/8"1/2"3/4"1"1 1/2"2"2 1/2"3"4"6"
Reducing Size Choose an optionN/A3/8" X 1/4"1/2" X 1/4"1/2" X 3/8"3/4" X 1/4"3/4" X 3/8"3/4" X 1/2"1" X 1/4"1" X 3/8"1" X 1/2"1" X 3/4"1 1/2" X 1/2"1 1/2" X 3/4"1 1/2" X 1"2" X 1/2"2" X 3/4"2" X 1"2" X 1 1/2"2 1/2" X 1/2"2 1/2" X 3/4"2 1/2" X 1"2 1/2" X 1 1/2"2 1/2" X 2"3" X 1/2"3" X 3/4"3" X 1"3" X 1 1/2"3" X 2"3" X 2 1/2"4" X 1/2"4" X 3/4"4" X 1"4" X 1 1/2"4" X 2"4" X 2 1/2"4" X 3"6" X 3"6" X 4"
HSS ASME BPE fittings are ideal for Bioprocessing and Pharmaceutical applications requiring mechanically polished surface finishes to 20 Ra min (0.5 Ra mm) ID maximum and 32 Ra min (0.8Ra mm) OD maximum. HSS ASME BPE Tubes are marked with specification, size, grade and heat number and BPE surface finish designation. Tubes are supplied in 20ft / 6M lengths with ends prepared for orbital welding and capped. HSS ASME BPE tubing is available from stock with ID cleaned for oxygen service. The electropolished tube is to 15 Ra min max (0.38 mm) ID. The ID of the tube is bright reflective and chromium enriched and receives 100% inspection. Cleaning is accomplished with High Purity Low TOC Deionized water and Electronic grade High Purity Nitrogen. HSS ASME BPE: Other ID cleaning procedures are available including thermocouple cleaning per ASTM A632 or Nitric Acid & DI Water Rinse. The DI water systems used guarantees 50 PPB with an average of 10 PPB and a restivity of 17.98 to 18.03. Ultra-High Purity 99.9999% pure Nitrogen is also utilized which is filtered to 0.003 micron at the point of use. Cleaning and packaging is performed in a Class 100 clean room. 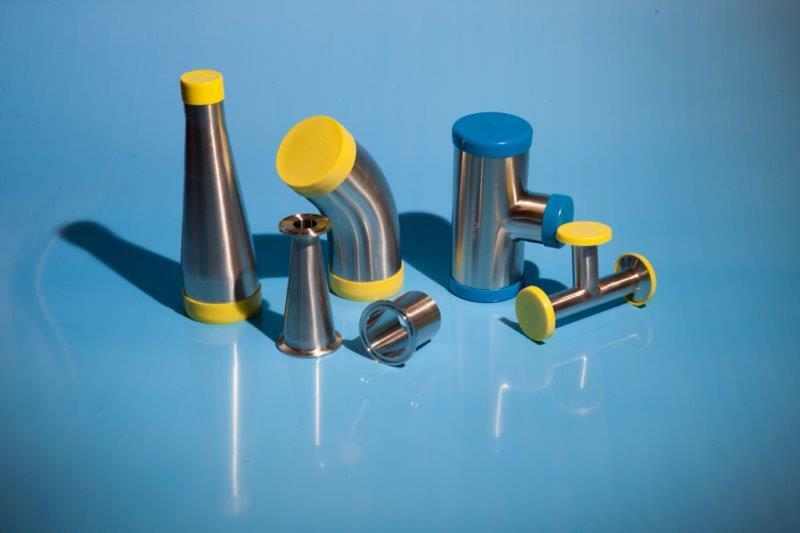 MATERIAL IDENTIFICATION & TRACEABILITY: All Hygienic Stainless Steels BPE Fittings are permanently marked with the material heat number, size, grade and the surface finish designation, or material identification number, depending on the size of the fitting. These numbers allow complete traceability of all component material back to the original material supplier. PACKAGING: All Hygienic Stainless Steels BPE Fittings have colour-coded end caps and are packed in sealed transparent plastic bags with a full part designation label attached. n/a, 1/4", 3/8", 1/2", 3/4", 1", 1 1/2", 2", 2 1/2", 3", 4", 6"
N/A, 3/8" X 1/4", 1/2" X 1/4", 1/2" X 3/8", 3/4" X 1/4", 3/4" X 3/8", 3/4" X 1/2", 1" X 1/4", 1" X 3/8", 1" X 1/2", 1" X 3/4", 1 1/2" X 1/2", 1 1/2" X 3/4", 1 1/2" X 1", 2" X 1/2", 2" X 3/4", 2" X 1", 2" X 1 1/2", 2 1/2" X 1/2", 2 1/2" X 3/4", 2 1/2" X 1", 2 1/2" X 1 1/2", 2 1/2" X 2", 3" X 1/2", 3" X 3/4", 3" X 1", 3" X 1 1/2", 3" X 2", 3" X 2 1/2", 4" X 1/2", 4" X 3/4", 4" X 1", 4" X 1 1/2", 4" X 2", 4" X 2 1/2", 4" X 3", 6" X 3", 6" X 4"